Join us and many of the nation’s leading Christian colleges and universities at the Ark Encounter in Williamstown, Kentucky, for College Expo 2019. This exciting event allows you and your students in grades 7–12 to visit one-on-one with representatives from Christian institutions across the country who hold to biblical authority and young-earth creation. College Expo 2019 is a free event. All registered students receive complimentary admission to the Ark Encounter and an opportunity to win a $500 scholarship. Immediate family members receive a 20% discount on admission to the Ark Encounter. And, new this year, students and their families receive a 20% discount on admission to the Creation Museum, located just 45 minutes north of the Ark Encounter. This event is free, but to prepare for your arrival we request that students register. All registered students have an opportunity to win a $500 scholarship. 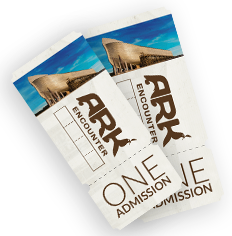 Immediate family members receive a 20% discount on admission to the Ark Encounter. Students and their families receive a 20% discount on admission to the Creation Museum.